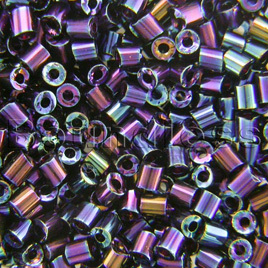 Preciosa Czech glass seed bead, size 11/0 Half coated Vitrail Metallic approximately 2mm Czech glass rocaille bead. 50 gram packs contain approximately 6500 Pieces. This half coating is on a very small bead giving flashes of Vitrail, the colour of the glass bead takes on a varying hue of colour complimenting the flashes of metallic pinks, bronzes and silvers.